NEW YORK — When last night’s lineup was posted in the visitors’ clubhouse at Yankee Stadium yesterday, there was a notable name not listed. Even though lefthander CC Sabathia was making the start for the Yankees, Mike Lowell was not in the Red Sox lineup. Instead, there was David Ortiz as the designated hitter, a decision made in hopes that Ortiz’s hot streak would continue. But it also meant that, yet again, Lowell would be sitting on the bench, a place he feels he has inhabited too much lately. “I think it’s a little unfortunate, but I think somewhat it’s painfully evident I don’t really have a role on the team,’’ Lowell said. “When Jacoby [Ellsbury] and [Mike Cameron] come back, I just don’t really know what my role is. With those two in the lineup, I don’t know who I would hit for. When I hit, I get pinch-run for. I don’t play defense. “I think sometimes you feel like the team might be better off if you’re not on it. I just eat up a roster spot, I really do. “I don’t know. If anything, it’s a good feeling that I’ve had so many teammates come up to me and they say they sympathize with my situation. I think I’ve truly agonized over it. With Ellsbury and Cameron absent for the last month, Lowell has had chances to pinch hit for the likes of Darnell McDonald, Jonathan Van Every, and Jeremy Hermida. Now that the two outfielders are closing in on returns to the major league club, Lowell will have even fewer opportunities for playing time, which leaves him wondering about his future even more. Lowell reiterated that he’s glad that Ortiz has begun to emerge from his slump. He said he doesn’t wish ill on anyone in the lineup, even though it might mean more playing time for him. Asked if he had given thought to requesting his release, Lowell said, “Have I given it thought? Sure. I think that’s a normal train of thought to go through. Is that something that would happen? I don’t know. I haven’t looked that deep into it. “I think that’s more upper management’s decision. They’ve been willing to eat a lot of my contract, so maybe that’s not holding them back. But I don’t know. There has not been much communication between him and the front office, Lowell said. He wasn’t told when he would play or when he wouldn’t. When manager Terry Francona was queried about Lowell voicing his frustration, he said, “He hasn’t to me.’’ But Lowell is clearly upset enough to go to the media with his unhappiness. “I thought about it a lot,’’ Francona said of last night’s DH choice. “But, in my opinion, the last thing I want to do is get in the way of somebody getting hot. CC has been tougher on righties at times. Ortiz, for the record, was 7 for 29 (.241) with two home runs off Sabathia. Lowell was 6 for 21 (.286). For Lowell, it chafes that he hasn’t been given the opportunity to get hot, to cash in on some of his better performances — like his 4-for-4 effort May 3 against the Angels — with consecutive starts. “I know I want to play baseball,’’ Lowell said. “I enjoy playing baseball. But I think that’s the element that’s a little bit out of my control. Cameron, still trying to come back from a strained abdominal muscle, will play today in Portland, while Ellsbury will rejoin the Sox in Boston. While it seemed Cameron was on the verge of coming off the DL at the start of this week, that no longer appears to be the case. Francona said Cameron probably needs two or three more rehab games. The Sox wanted to make sure Cameron was just sore, not injured, so he spent the last two days working out at Fenway Park. He was checked by doctors there as well. J.D. Drew came out of last night’s game after doubling and scoring in the Sox’ four-run rally in the eighth inning. “His left calf was hurting, he was trying to compensate and felt his right hammy,’’ Francona said. “It was cold, so we got him out of there. Ended up being the best thing I did all night.’’ Drew said he expects to play tonight . . . David Ortiz was thrown out at second in the eighth inning after he spent too much time admiring a blast to right-center that turned out to be a single. He was easily out on the relay from center. Asked if something would be said to his DH, Francona said, “That’s kind of our business. I’m confident that won’t happen anymore. Good swing. That part, I’m confident will happen.’’ Ortiz clearly thought the ball was out. “Oh yeah. No question,’’ he said, adding he was a bit mad at himself for not running full speed out of the box. “Turn the page,’’ he said . . . The win ended the Sox’ three-game losing streak. They also ended their eight-game losing streak at Yankee Stadium. It was just their fourth win in the last 18 games against the Yankees . . . The five-run lead for the Yankees was the largest the Sox have overcome in New York since coming back from a 5-0 deficit July 26, 1994, according to the Elias Sports Bureau . . . Kevin Youkilis’s home run was the 100th of his career . . . Marco Scutaro had two errors, the fifth time in his career he has committed multiple miscues in a game . 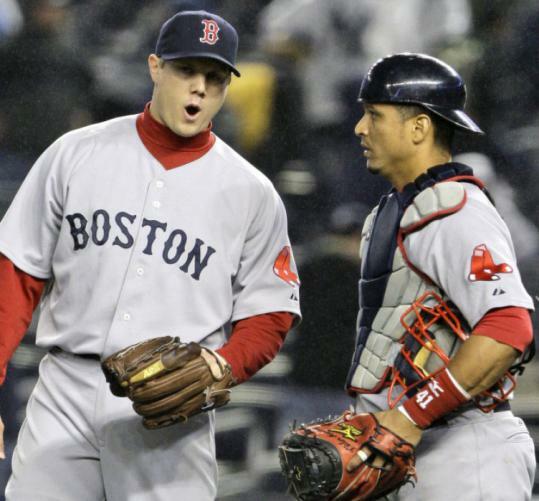 . . Boston starters have a combined 7.44 ERA against the Yankees this season. The tough schedule continues when the Sox get back to Boston today, as they play two against the Twins, then head back on the road to visit Philadelphia and Tampa Bay. So where does this team go from here? “If you’re asking if we’re going to quit, no,’’ Francona said. “Are we pleased with where we’re at? No. We’re getting tested a little bit. How we answer those questions will go a long way. One of the things we talked about the first day of the year is how you handle frustration. Because I really believe in this game there’s so much frustration, even on good teams, that how you handle that — and I mean as a team, not individually — that’ll define a lot of our season. And right now, we’ve been tested a lot. And how we handle that’ll be huge.’’ . . . Monday night marked just the second time the Sox had overcome a deficit of at least five runs before losing the lead in the bottom of the ninth vs. the Yankees, according to the Elias Sports Bureau. It last happened Oct. 2, 1921.